At long last, my Summer Cabins quilt is finished. Most of these wonky log cabin blocks were made by the members of Sew Bee Wonky. I am thrilled with how this came out. It is 63" square The colors pop against the wide Kona Coal sashing and I got to show off the Mendocino prints I love so much in some random large blocks. Thanks so much for the blocks, Ladies! This was my first virtual bee and "sew" much fun! Ha ha! It looks wonderful! I love the gray background and binding! This page contains a single entry from the blog posted on August 3, 2011 8:41 PM. 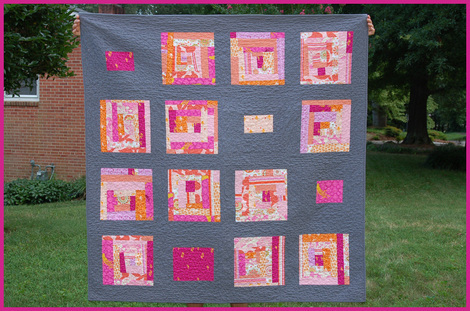 The previous post in this blog was Confetti Quilt Hints and Tips. 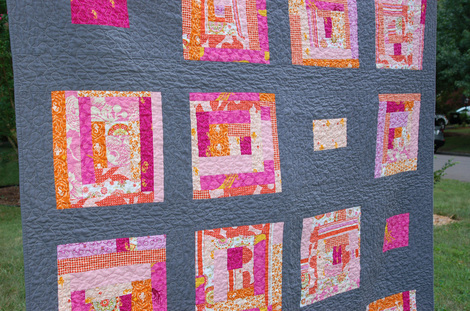 The next post in this blog is Cathedral Window Block and Charm Swap.